Here at the burrows, we know that kitchens are for more than preparing food! It truly is the heart of the home, and our beautiful kitchen is designed for just that: to be enjoyed by all. It boasts a center island with stools for gathering, and a stunning viking 36” stainless steel, 6 burner gas range for professional chefs and professional eaters alike! Paired with it are the other stainless appliances - full fridge with freezer, dishwasher, and a perfectly temperature controlled wine chiller. Our dining room offers enough seating for eight, there are plenty of dishes, cutlery, glasses, mugs, serving plates and bowls - plus all the amenities of home: can opener, salad spinner, coffee maker, toaster, baking pans and more! If you would like your favorite beverages chilled and waiting for you, or if the last thing you want to do when you arrive is go grocery shopping, let us do it for you! Ask us about our shopping service - you give us a list of your favorites and we'll try our very best to get you what you need! We'll give you the original receipt, so you only cover the cost of what you order and have an opportunity to make a donation to the awesome team at North Shore Rescue. In true west coast style, our great room is fully furnished and features a grand 16 foot barrel ceiling, exposed wood beams and floor to ceiling windows to maximize the view! For those who enjoy a good book with a great view, our library area is complete with a beautiful fireplace, shelves filled with books, magazines, and board games for everyone to enjoy during your stay. Slide open the patio doors in the great room to take advantage of the ocean breeze, or step onto our patio! The opening from the great room to the patio creates an amazing indoor/outdoor feel. Lounge on the deck year round for optimal ocean living! For the self-appointed grill master, we have the perfect partner for you: a stainless steel natural gas barbeque! Our master suite features a king sized bed equipped for royalty - complete with luxurious sheets and duvet. Not just for sleeping, the room offers a tv with and cable. The spacious master ensuite comes fully equipped with a large soaker tub, shower option, and all the amenities of home! Our second and third bedrooms feature oversized windows that frame a beautiful view of the boats in the marina and the skyline beyond it. Not to worry though, our drapes ensure complete privacy so you can have the best of both worlds. Both rooms hold queen sized beds with luxurious sheets and duvets that will ensure peaceful rest. Each of the bedrooms have their own tvs equipped with cable, standard closets and private ensuites; room two features a bath tub with shower fixtures, and room three has an easily accessible walk in shower. We also have two convertible BoConcept ottomans in the living room that fold out into single beds, and a Barcelona daybed on the main floor - this home can sleep up to 8 guests! We are Peggy and Jeffrey Lim. Together with our adult children, we've built our dream vacation home. A waterfront property is something that we've worked our entire lives for and are proud and happy to have fulfilled this dream. We own a cafe up the hill in Lonsdale, North Vancouver, and after years of serving the community and residents, we realized just how much we love to meet new people and are more than happy to open up our home to you. We can't wait to provide you with a comfortable and memorable stay. We are always asked about the name 'The Burrows' - here's a little background information that will help make sense of the name: Being Vancouverites, our family are die hard fans of our beloved hockey team, The Vancouver Canucks! (Go Nucks!) The matriarch of our family, Peggy, has a special place in her heart dedicated to a certain Canucks forward --- jersey #14, Alex Burrows. When we discovered that our address would be #14, Peggy immediately started jokingly referring to the house as 'The Burrows'. As we seriously started brainstorming names, we couldn't find anything we liked better, and figured that the name reflected our family, love for our city, and our excitement to share it! Welcome to The Burrows Vancouver! Started from a dream, and being built into reality - it’s our home away from home and would love for it to be yours too! The Burrows is part of a special community of ocean homes located at Mosquito Creek Marina in North Vancouver, BC. It’s location boasts unparalleled views of the downtown Vancouver skyline to the South, the legendary “Lions” mountains to the North, at high-tide enjoy a view of the breathtaking Stanley Park and the beautiful lights of the Lions Gate Bridge to the west! toilet, combination tub/shower, Large soaker bathtub. Huge and spacious unique 3 bedroom floating home overlooking the Pacific Ocean with the Downtown Vancouver Skyline in its midst! Our home is truly something special and the spectacular views and setting are something that you'll remember for a lifetime. Heated tile floor in the main hallway as well as in every bathroom. With in-door water and ice dispenser. Viking 6 burner natural gas range with large electric oven. Gorgeous gourmet kitchen that will make any chef drool! (4) One in each bedroom and one in the living room. (4) Cable TV in the living room and in all 3 bedrooms. The Burrows was a great place to call home for 3 days! Close to everyone in North Vancouver and an easy Ferry ride to Vancouver - The Burrows had everything we needed to call home....plus it was just fun to stay on a houseboat! The Burrows is a beautiful home in a great location. We loved being right on the water and watching the resident star fish. :) It was perfect for our family trip to Vancouver. Thank you Peggy for making us feel so welcome! 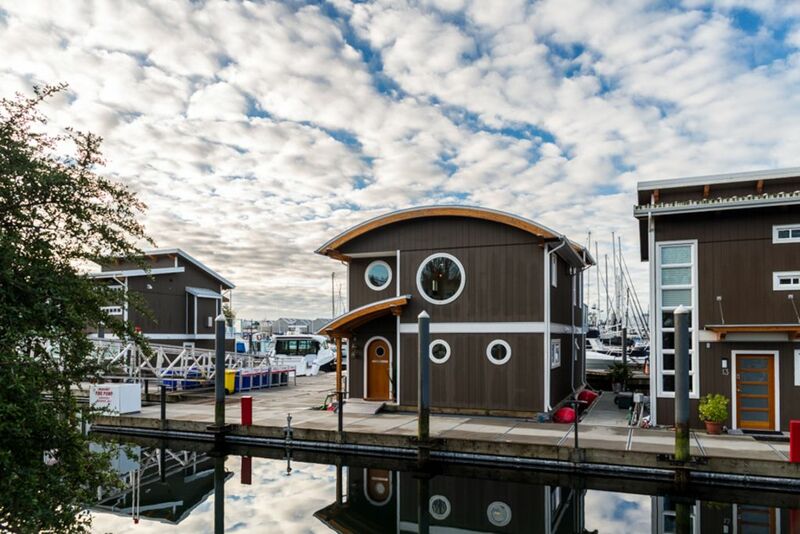 Comfortable, well-appointed unique floating house. Great views of the city skyline, easy access to public transportation and Lonsdale neighborhood. Owner Peggy is lovely! Staying in the Marina, right on the water was a fabulous experience.! This float house is perfectly situated to take advantage of the afternoon sun and the incredible views looking back at the city. Shopping, hiking and the Sea Bus are all walking distance - not to mention restaurants and entertainment. This is a spacious 3 bedroom, nicely decorated - you won’t be disappointed. Amazing stay at a beautiful home! We had a fabulous stay at Peggy’s amazing home. Peggy was an excellent host, so friendly and any questions we had were promptly answered. The home itself was well appointed and in a fabulous location. We just wished we could have stayed for longer! Our home is a short 12 minute seabus ride into Downtown Vancouver where you will find shopping, many fabulous eatery's, our world renown Stanley Park, Gastown, Granville Island, many outdoor activities, major concerts, museums, aquarium and stunning beaches. If you wish to stay in North Vancouver, the quaint Lonsdale Quay Market is a 7 minute waterfront walk which is perfect to grab a bite to eat or do some fresh produce shopping. North Vancouver is also home to many hiking and biking trails, excellent ski hills, the famous Capilano Suspension Bridge, and much more! Our world renown Olympic ski hill, Whistler Mountain is only a 1 hour drive away - prepare to be wowed by the breathtaking Sea to Sky Highway.